Find out why this telecom giant, ad buying platform, and data analytics company are worth a look. The bull market in the tech sector continues to rage on. Thankfully, even in pricey markets, there are always great stocks to buy if you're picky. So, which tech stocks are looking good right now? We asked a team of Motley Fool contributors to weigh in, and they called out AT&T (NYSE:T), The Trade Desk (NASDAQ:TTD), and Alteryx (NYSE:AYX). Tim Green (AT&T): AT&T is transforming into a media company, with the acquisitions of DIRECTV and Time Warner broadening its business. AT&T now owns HBO, giving it a direct competitor to the fast-growing and heavy-spending Netflix. But the main reason to buy shares of AT&T is the dividend. With the stock down this year, the dividend yield has been pushed up above 6%. It hasn't been this high since 2011. AT&T's dividend isn't likely to grow very quickly -- the last increase was just 2%. But the company has raised its dividend for 34 consecutive years, so investors should have some confidence that those payouts will keep marching higher. T Dividend Yield (TTM). Data source: YCharts. There are some risks involved. AT&T's acquisition spree has required a lot of debt, and the balance sheet shows it. The company was weighed down by about $190 billion of debt at the end of June, requiring quarterly interest payments of more than $2 billion. A little less than one-third of AT&T's operating income in the second quarter went toward servicing that debt. More debt makes AT&T more fragile, plain and simple. The company's scale and the massive barrier to entry into the wireless business give it significant competitive advantages. But the company's other businesses are a different story. 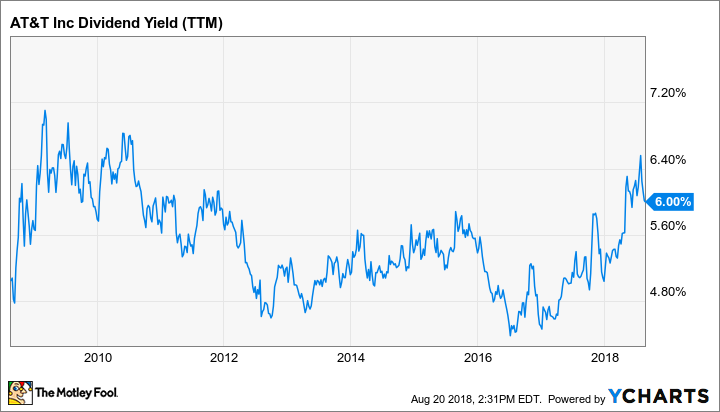 If you're looking for a high-yield tech stock and can stomach the mountain of debt, AT&T hasn't been this cheap relative to its dividend for years. Now's a good time to pick up some shares. Danny Vena (The Trade Desk): The realm of digital advertising is largely the domain of tech giants with billions of daily users, but there are other companies that are carving out a space in this large and lucrative market. The one with the most promise in the space is programmatic advertising specialist The Trade Desk. In its simplest form, programmatic advertising uses software to purchase digital ads, across a variety of channels and formats, including display, video, in-app, web, and audio. These ads can also be placed on a host of devices including computers, mobile devices, and connected TVs. This process forgoes the usual ad-buying process that requires a request for proposal, price and placement negotiations, and manual insertion orders. The Trade Desk created its own cloud-based software platform that uses computer programs to automate digital advertising campaigns in real time -- by placing ads where they will be most effective at the lowest cost to buyers. Filling this vital role has allowed The Trade Desk to generate significant growth. In its most recent quarter, the company produced record revenue of $112 million, up 54% year over year and adjusted earnings per share of $0.60 increased just 15%, but that was due to tax provisions. Both numbers sailed past analysts' expectations and the company's already ambitious forecast. Sales in a variety of categories help illustrate the magnitude of the opportunity. Mobile in-app revenue grew 104% year over year, while mobile video climbed 156%, and audio grew 191% compared to the prior-year quarter. Connected TV demonstrated the most explosive growth: after growing more than 2,000% last quarter, revenue more than doubled from those levels in the current quarter. The Trade Desk also reported a customer retention rate of 95% for the 19th successive quarter. The convergence of television and internet, and The Trade Desk's international expansion will likely continue to fuel the company's impressive growth rates -- and investors should climb aboard the programmatic advertising revolution. Brian Feroldi (Alteryx): The business world is awash in data that can be used to make decisions. Unfortunately, translating that data into useful information isn't always a straightforward process. That's a gap that is being filled by data analytics providers like Alteryx. Alteryx is a software-as-a-service business that enables users to crunch huge amounts of data in an easy-to-use format. Demand for the company's platform has been soaring for years. Alteryx's customer count grew by 40% last quarter to nearly 4,000 customers. Better yet, the company's dollar-based net revenue retention rate -- which measures how much money is being spent by existing customers -- grew 131%. The combination helped drive a 54% jump in total revenue. Can the company keep this phenomenal growth rate going? I think the answer is yes. Management estimates that its total addressable market opportunity is worth $29 billion. That's a massive number considering that the company is "only" expected to pull in about $200 million in total revenue this year. To take advantage of the huge opportunity it sees ahead, Alteryx has been investing heavily to build out the platform and expand its commercial team. The combination is causing the company to post a modest loss on the bottom line. That fact shouldn't worry investors since the company's balance sheet is packed with more than $400 million in cash. The biggest knock against investing in Alyteryx right now is its generous valuation. Shares have more than doubled since the start of the year, which has pushed the company's price-to-sales ratio above 20. While there's no doubt that the valuation is rich, I think that the company is still in the early innings of a multi-year growth phase. That makes right now a great time to pick up a few shares.